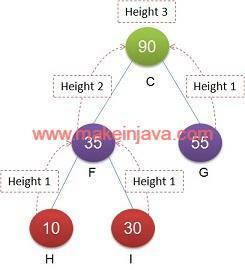 Given a binary tree, find out height of binary tree using recursive algorithm. Traverse the binary tree using depth first search (DFS) algorithm. What is height of binary tree? Height of binary tree is number of edges from root node to deepest leaf node. We have already discussed find height of binary without recursion using BFS. We will discuss couple of examples to calculate height of binary tree. We will consolidate the height of left & right subtree, to get height of binary tree. 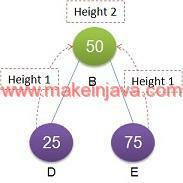 Height of binary tree = max (height of left subtree, height of right subtree). Example 1: find height of left sub-tree, rooted at node A. Height = max(height of left subtree, height of right subtree) + 1 ( Node B). Example 2: find height of right sub-tree, rooted at node A. Go to Node F and apply Example 1 algorithm. Height = max(height of left subtree, height of right subtree) + 1 ( Node C). Height of binary tree (at node A) = max (height of left sub tree, height of right subtree). The time complexity of algorithm is O(n) . 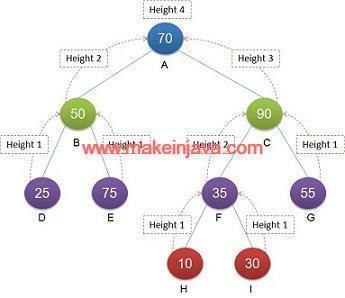 HeightOfTree class is used to find the height of binary tree using depth first search algorithm. Node class representing the nodes in a binary tree. We are the creating binary tree in main method. 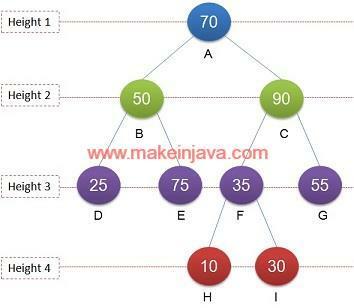 We are calling method of HeightOfTree class, to calculate the height of a binary tree.